He will receive a framed copy of his cartoon with recognition from Supply Chain Digest and be eligible for our semi-annual prize as voted on by readers. New cartoon on the SCDigest web site on Monday, May 10, 2010. "Let me guess, he transferred here from Daytona." 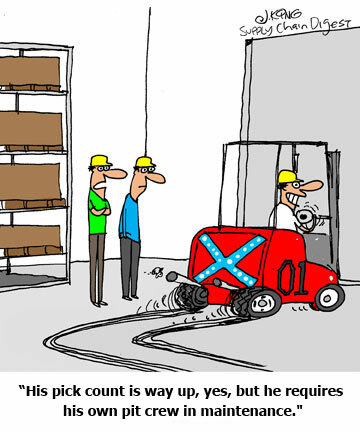 "I think I understand now why our recordable accident rate is trending up." “That? Well at last week's team meeting I said "Generally, safety has been good so far this year..."
"Last week he put Kyle into the wall..."
“So that’s why he keeps calling me Boss Hogg." "Now if we could get him to actually move materials." "We do have those voice-directed trucks, but they can't match The General Lee for speed."